The leaves are changing, the air is crisp, you’ve picked your apples, so what’s next to celebrate the fall season? Well, pumpkin picking of course! Rhode Island is home to a variety of farms and orchards offering only the most beautifully vibrant and fresh pumpkins around! 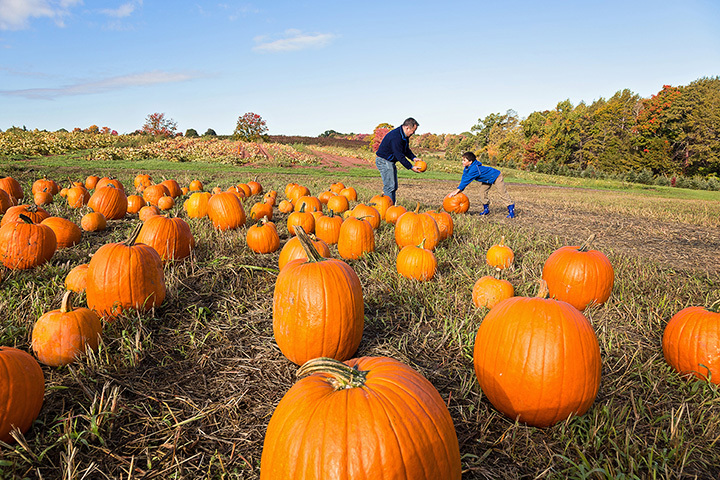 Pick out your favorite at these best pumpkin patches in the state. Come for the pumpkins but stay for the corn maze! The professionally-designed maxes are incredible. Get lost with family and friends—this maze takes visitors on average an hour to solve, though the correct path can be covered in 30 minutes. On your way out, be sure to pick up a big orange pumpkin to take home with you! Best-known for their wide selection of apples, perfect for picking with the family in the fall, Dame Farm also has a small pumpkin patch overlooking a gorgeous countryside view of Johnston, Rhode Island. It’s the perfect small trip for a family living in Providence, or even an inexpensive Uber ride for college students. In addition to classic fall fare such as farm-fresh produce and hayrides, you can also visit Manfredi’s for fresh jams & jallies, picnics, and of course...pumpkins! The kids will love the play area and corn maze, too. Pick your own apples or pumpkins at this award-winning farm. Located near Newport, the setting has played host to weddings, too. Hungry by the end of a day of pumpkin picking? Grab a table at the farm’s café, serving food with only the freshest ingredients. This classic small pumpkin patch is a hidden gem. You’ll have plenty of time to pick your own pumpkins, grab a cup of hot-pressed cider, and maybe even get lost in the corn maze! A cheaper alternative to Sweet Berry Farms, this little farm offers apple and pumpkin picking. A pleasant drive through Rhode Island farmland will land you at their orchards in Little Compton. The orchard recently added several new delectable treats to their stand like honey, maple syrup, and beeswax candles, in addition to more classic pumpkin-based treats. This farm is located right in the heart of Apple Valley. Its website boasts that it is the oldest apple orchard running in Smithfield—in fact, its currently operated by the fourth generation of Jaswell’s. After lugging back one of their huge, round pumpkins to the trunk of your car, you’ll want to replenish your energy. For that, try one of Jaswell’s mouth-watering gourmet chocolate apples. You won’t find another apple like them anywhere else. This family farm is open every day in the fall, starting things off early at 9 a.m.! At the beginning of the fall, they even have raspberries and tomatoes ready to pick. With a lovely property and an even lovelier staff, this is a great place to bring family or friends on a fall weekend! Families love coming back to Confreda’s year after year—the local farm is busy every summer brewing up new ideas for their fall customers. Spend between $3 and $300—hayrides are free, but there’s plenty to shop for in addition to picking pumpkins. Make sure not to pass up on an apple cider doughnut before you leave!